Does this take on delay-pedal history merit a place in your pedalboard’s future? Based on the same hardware and metal casework as their Flashback X4 delay pedal, TC Electronic’s Alter Ego X4 Vintage Echo sports a smart custom livery. It also ships with an entirely new set of programs, which were created in partnership with Aaron and Andy of US-based guitar-effects specialists ProGuitarShop. Unlike many pedal delays, this one has a massive seven-second delay ceiling, and the stereo inputs can also be used in mono. There’s also an expression-pedal input, a mini-USB port for software updates or editing, and a pair of MIDI In and Thru sockets. MIDI may be used to call up the three presets, or to sync the delays to MIDI Clock. As shipped, the Alter Ego X4 offers the user 12 delay effects that emulate classic hardware delay devices, the one obvious omission being that I couldn’t hear any multi-tap delays; they’re all seemingly based on evenly spaced repeats with feedback. A small toggle switch can also turn the pedal into a 40-second looper. The patches tip their hat to specific vintage devices, including the Binson Echorec (which used heads placed around a magnetic drum rather than tape), the Watkins Copicat and Roland’s Space Echo. Other presets are based on the likes of the Electro-Harmonix Deluxe Memory Man analogue delay, as well as more modern digital delays. The analogue delay algorithms capture the signature blurriness of the bucket brigade chips used in those devices, which make the repeats gradually more indistinct as the delay recirculates. The Echorec’s signature modulation has been recreated in some detail, with a very mild vibrato hinting at a subtle rotary speaker character. Apparently this was a key part of David Gilmour’s Pink Floyd guitar sound. Other nods in the direction of delay history include the Tel Ray Organ Tone (very wobbly), TC’s own Electronic 2290 with modulation, a modulated reverse delay, a Boss DM-2 and a Maestro Echoplex 2. The reverse delay works extremely well, but unless you set the internal switch to Dry Kill, you also hear the dry sound as well — which isn’t always what you need. By default the four slots are filled with patches created by well-known artists, but you can assign any downloaded or user-edited patches in there. This pedal being one of the TC TonePrint family, though, you have much more choice than the factory presets: you can download free patches from TC’s extensive online library via a free iOS/Android app. The pedal can accommodate four of these patches. Your phone sends the patch information directly to the pedal, simply by holding the phone close to your guitar pickups. Another app, TonePrint Editor (Mac, Windows or iPad), allows you to create your own patches. The total package gives you a choice of 16 delay types, with three footswitch-accessible presets and tap tempo. When using tap tempo, a three-position toggle switch provides a choice of three note values. To the left of the top panel, a 16-position rotary switch selects the delay mode. This is joined by Time, Feedback and Delay Level controls for the echo setting and a Level control for the looper when in that mode. Unless the dry sound has been turned off, it passes through at its original level without digital conversion. The user can also choose between a buffered bypass mode that allows the delays to die naturally, or a hard bypass that cuts them off immediately. The four footswitches, each with a status LED, call up either the three user presets plus a tap tempo, or in Loop mode act as Record, Play, Once and Undo buttons. In Loop mode the delay controls are still active in a ‘what you see is what you get’ kind of way, and any delay effect used when recording a loop is recorded as part of the loop. This was my first experience of the TonePrint Editor software, and although it doesn’t dig nearly as deeply the in-house software TC use to create their patches, it allows you to set up the delay type, filtering, feedback and modulation in reasonable detail without things ever getting too daunting. The controls are what you might expect to find in a typical delay plus modulation plug-in. You can save as many patches as your computer has space for and, of course, any four of them can be saved to your four Alter Ego TonePrint slots. Saving patches to the A, B or C switches is just a matter of calling up the desired effects, making adjustments to the speed and feedback if necessary, and then holding down the switch for a few seconds (the LED flashes green then back to red again) to store the preset. TC have managed to strike a good balance between instant gratification and editing complexity by making the pedal very easy to use in stand-alone use, yet also making it possible for those who want to edit some patches of their own to do so. The vintage-style effects are very convincing with the tape delays and the Echorec being the stars of the show. The Copicat emulation seemed a bit cleaner than I remember mine sounding back in the day, but I’ll let that pass — they probably based the sound on one that wasn’t gigged to death! Despite the limited number of hardware controls, the TonePrint system grants you access to a whole library of presets, as well as editing software which allows you to tweak in far more detail.The noise performance is certainly good enough that you could use the pedal in the studio, and in the analogue delay section I’m pleased to say that the designers weren’t tempted to include the noise and quantisation distortion that such devices were often plagued by. All the emulations sound very close to their ‘inspirations’ and, perhaps more importantly, they sound musical and organic. While I’d have welcomed some way to adjust the modulation depth of some of the presets, it isn’t difficult to use the editing software to program modulated delays of your own. Some users will wonder why there are only three memories accessible via footswitch but, in reality, that’s probably enough for most people, especially as tap tempo is always accessible in Delay mode. And it keeps things simple. The whole TonePrint idea is a great one, and with the editing software you can get a lot more variety out of this pedal than its simple interface might initially lead you to believe. 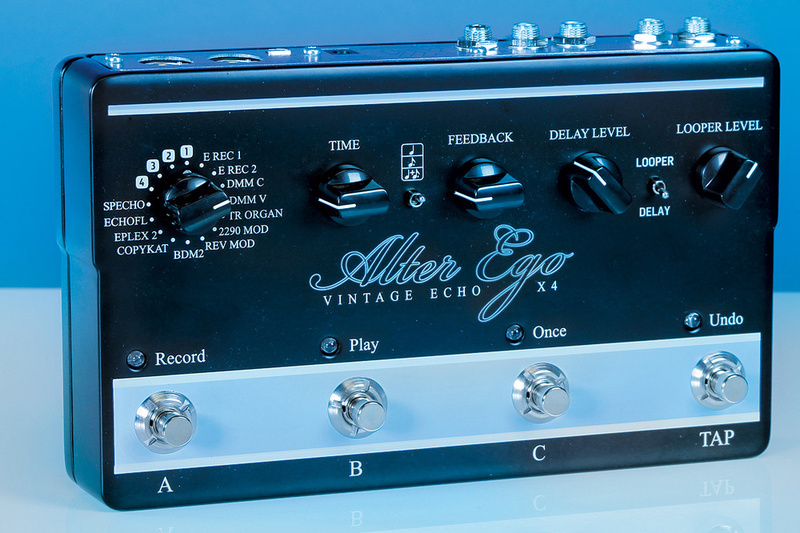 Given that the cost isn’t much higher than for some ‘two knob, no memory’ pedals or some delay plug-ins, and taking into account the very authentic recreations of some very tasty pieces of classic hardware, the Alter Ego Vintage Echo should make a lot of friends — and not just amongst guitar players. There are lots of delay boxes out there but few offer such a range of emulations. Boss offer a very good Space Echo pedal, for example, but it emulates the Space Echo alone. Korg’s SDD-3000 pedal covers all the usual bases, as well as offering a recreation of the original SDD-3000 rack unit, and offers more front-panel control — but it costs significantly more. 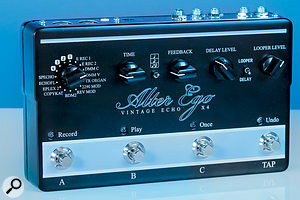 High-quality delay devices are also made by Eventide, Strymon and Electro-Harmonix amongst others. Good emulations of classic delay devices. Suitable for stage or studio use. 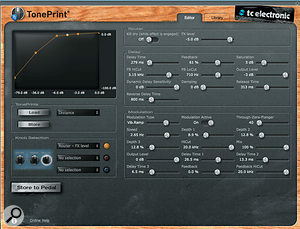 Free TonePrint Editor software and preset downloads. No modulation control other than for the four user slots (via the Editor software). Although limited in terms of front-panel adjustment, the Alter Ego produces some great vintage delay sounds right out of the box, while the ability to load TonePrint patches and to edit your own delay effects makes it far more versatile than it might appear at first glance.